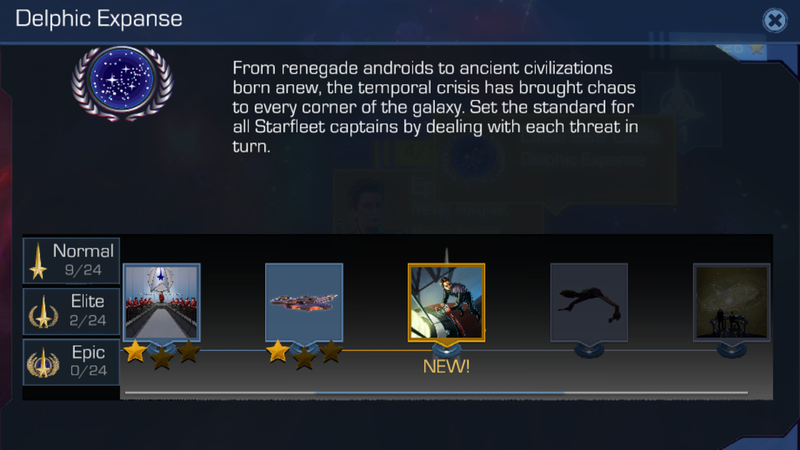 For the last two weeks I've had the fortune to be playing the beta version of Star Trek Timelines and this week it's gone live across the world! 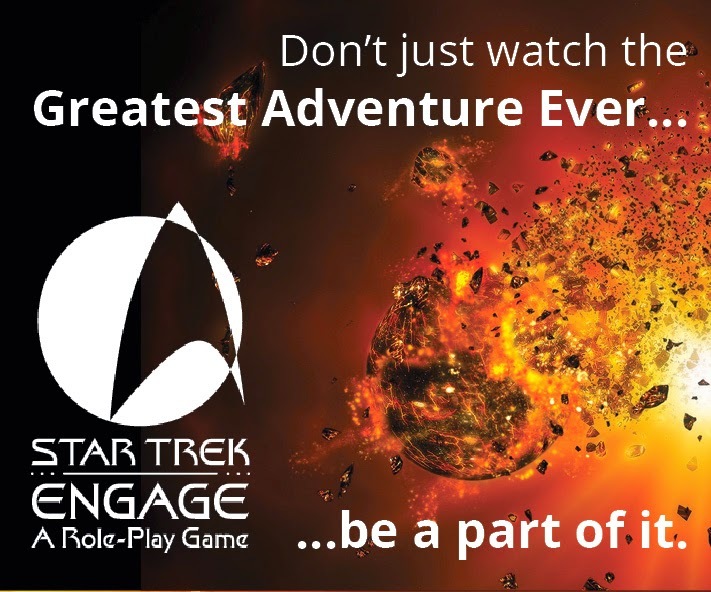 For months we've been waiting for its arrival, to play this generation spanning adventure that we hoped would rock the Star Trek gaming world. 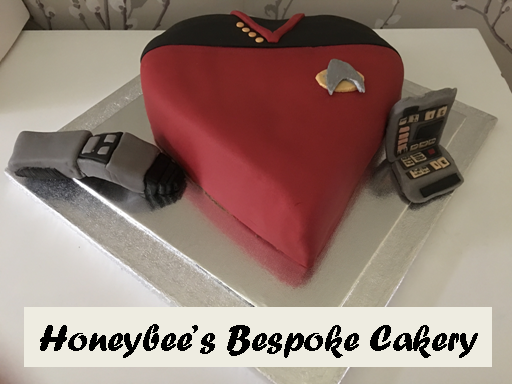 So, after two weeks of testing and as it now drops onto the phones and tablets of Trekkies everywhere on iOS and Android, what do we really think? It's like no other mobile Star Trek game you have ever played. Fact. I could just end the review there and leave you to download it but let's get a little closer and have a better taste of game play. Set aside Trexels, maybe even pause Online because here's something new and very close to the original material. At the core of Timelines we have a temporal anomaly which has brought characters and ships from different times into one place hence you can be fighting a Constitution Class in its original styling with a Constellation class ship one minute then having Sisko, a Hirogen and Uhura teaming up for an away mission the next. On one mission you're at Regula One, then in a heartbeat you're orbiting the Caretaker Array - yes, the possibilities and combinations truly are endless with Timelines via this wonderous plot device. Reed - slightly proficient in Command and Security. Rubbish at Medicine. As you progress through the game completing episodes or cashing in prize funds you'll gain additional characters who can join your crew and provide a healthy bundle of benefits. There are six distinct skill sets; Command, Diplomacy, Science, Medical, Engineering, Security and each character carries a combination of one or more of these abilities and at differing skill levels. Got it? Good, because each character will also have certain personality traits that will provide extra bonuses on away missions and help complete tasks more effectively. For example, Ezri Dax has the Medical skill but doesn't have the Doctor personality trait which could leave some paths through an episode segment locked until you have a suitable candidate (e.g. McCoy) but then you might need to level him up in turn to finish the job. One issue here is that the Train and Advance buttons don't respond to touch very well and require numerous "taps" to try and level up your character. Very annoying and something I hope is fixed soon. Each task within the episode path will tell you if it's easy, medium or hard to complete for the characters you choose to fulfil the mission and that's the big winner for Timelines. You truly do have the chance to make each and every decision, learn from your mistakes, try different combinations and even replay multiple episode acts different ways and with different characters to collect all the rewards available. 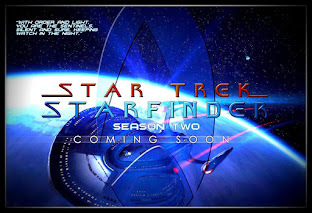 So far I've only had the chance to play though episodes focused on the Klingons/Augments and a second starring the Maquis/Cardassians/Bajorans but there's been a lot of variety just in these. Besides the action elements you also need to talk to the races you encounter to turn them into either allies or enemies and thus gain further reward through conversation choices. In regards to the rewards they help level up the skills of your characters by providing then with equipment which can be either purchased one-off or will need to be built from components. 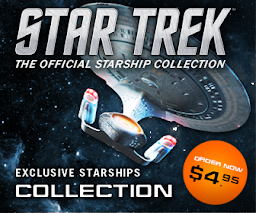 That can take some time but you can buy them with the rare dilithium or with accumulated credits dependent on the pricing. 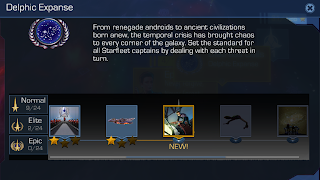 In addition you can drop crew with required skill sets on diplomatic shuttle missions which will see them locked from standard play for a couple of hours but might bring back some needed component rewards and help with the episode you're playing. And why? 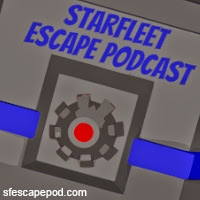 Because each shuttle trip takes you to a particular faction be it Klingons, Maquis, Dominion... And will help secure a faction's victory which may get you some higher skilled crew. I was a bit picky here since the Dominion's homeworld is Xindus and the Hirogen have their "home" at Pollux IV?! 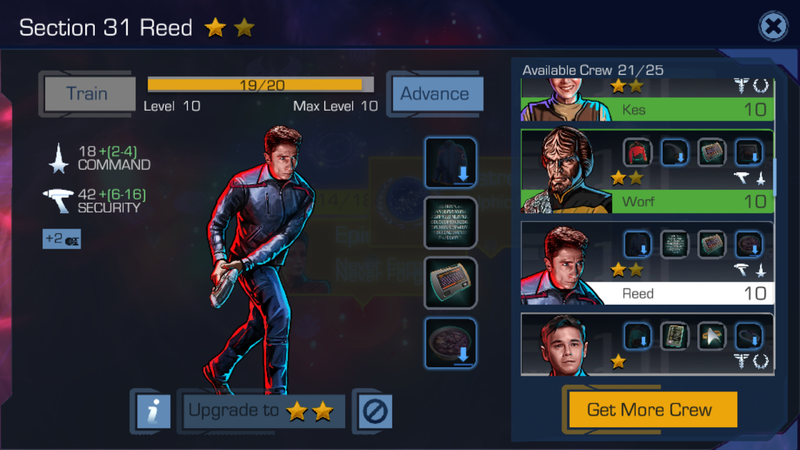 I loved getting new crew and finding how great or useless they could be. 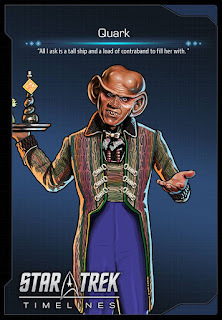 Hirogen Donik (from Voyager's Flesh and Blood), Promoted Sisko (The Adversary) and Desert Ezri (Shadows and Symbols) became firm favourites as did Commander Spock if only for his superior science skills that saved more than a couple of missions from going south. 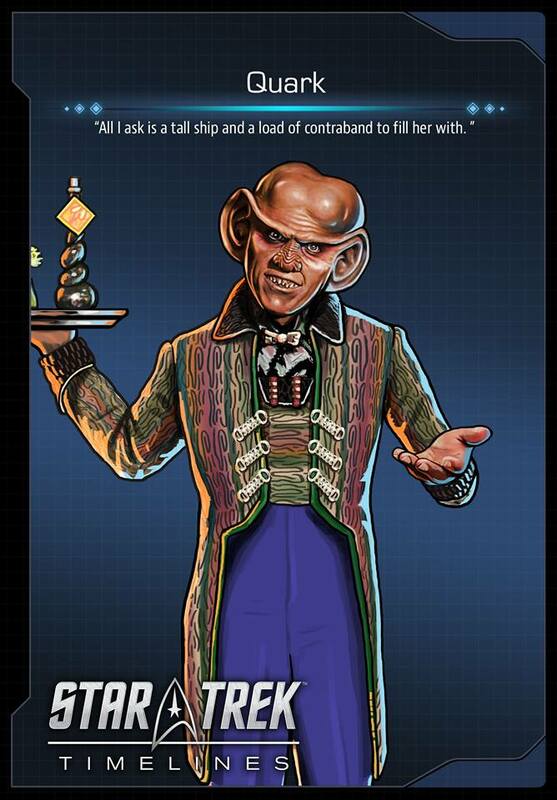 There were some duffers too; Cardassian Investigator Odo (Necessary Evil) was a poor choice with a low security score, Simon Tarses from The Drumhead did little to set the world alight in medical or diplomacy but just seeing that they were included demonstrates the incredible attention to detail that had gone into the creation of Star Trek Timelines. Indeed there were a few moments of "Really...?!?!" when both Keiko and then Nurse Ogawa appeared or I realised that I could use clean-shaven Wil Riker in a more useful fashion. In my crew for the full game I now have, finally, some decent medical staff but my engineering skills are lacking. That and I now have two versions of Wesley. Does someone hate me that much?! Oh and just so even looking at your roster isn't a dull affair each character has been loaded up with a few choice soundbites. Great for the first few hours but there's only so many times I could listen to Sisko bemoan war being the only hope before it got muted. The images and detail that have gone into not only creating the look of each character and in some cases multiple versions of that character is just astounding and we have been teased that more will be coming in the future as the game expands and develops. I cannot wait to see who they add for the second release. Perhaps there is one big failing with Timelines however and that comes in the form of space combat. Over the course of the beta testing there were two versions released. The first relied on a lot more planning and perception to defeat your enemy and progression would be determined by how much damage you received. The updated version was much more button bashing and a lot less skill requiring more patience to wait for a skill recharge than actually thinking of your next positional tactic to take out that rusty Bird of Prey. It is a big problem and one that is really crushing since the other aspects I've played as so damn good and immersive - space combat is a bit of a slap in the face. That said it does seem ever so slightly harder in the "real" game now released so it seems there might have been some further tweaking before launch. As with the majority (it seems) of games available in the mobile sphere, there is a paid element to this "freemium" product. Chronitons are your cash to open and play each episode segment and fully recharge (to 40) in about three hours with each "turn" costing between four and eight points so they do get used quickly. You can of course buy more by depleting your Dilithium supply but that too is finite and requires cold hard cash to replenish. 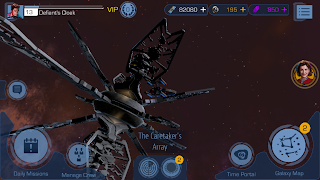 Dilithium is the gold of the game and with it you can purchase better characters, ships and equipment from the Time Portal. 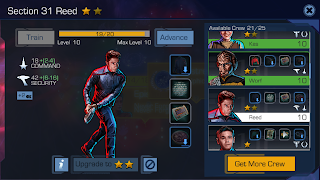 Regular points acquired from the game will get you items but at a lower skill and star level (usually one or two star max while Dilithium can get you a five star character). Yes it's annoying when you run out of points and have to replay levels to build up skills or credit but that's the nature of the mobile gaming beast and there will be people paying for those skills as well as the VIP perks which also assist in your play. Also Dilithium is your currency at the Dabo Wheel where you can gamble some funds to receive a random item - no guarantees what it might be though! 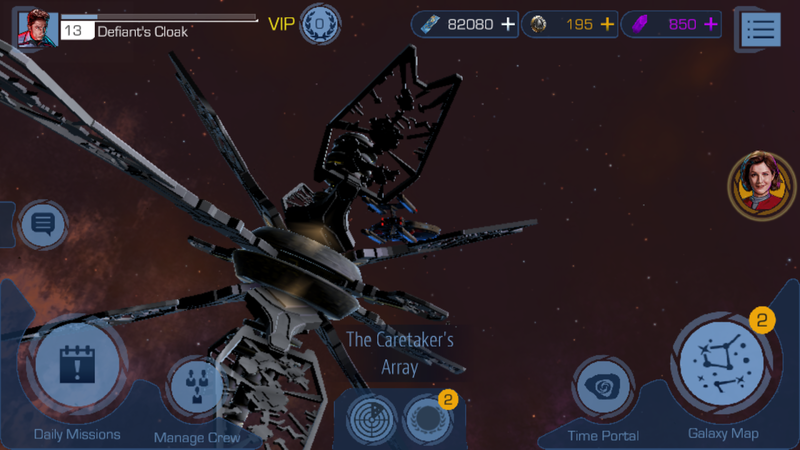 It's also a shame because I didn't get chance to fight in anything other than a quad-engined Constellation Class nor did I get an opportunity to experience the feature of assigning crew to areas of your ship but I'm guessing there were some bits held back for launch to keep us all super-excited. Having a hunt around though there is a large diversity of ships too - Voyager, the D'deridex Class Warbird, a Maquis Raider, the HMS Bounty Bird of Prey, Defiant and many, many more each with it's own foibles available when you collect their schematics in the same way as equipment. Due to the beta being updated I didn't have a chance to play the second style of space combat in PvP but I suspect it may have been better in its first iteration. Sadly in the second beta the Delphic Expanse story was locked which did limit my exploration a little although in the full version it is now back open. PvP is still "coming soon" however but at least I can add up some friends and level up a few times to stand me in better stead when it does come available. There are just so many different facets and ways to play with Timelines that this is a game that is never going to be boring. I know there will be paid ways to increase your abilities and level up quicker but if we look past that to the essence of the product I think it's very clear to see that Disruptor Beam have done fans proud from every angle. I loved testing the game and in the fortnight I ragged the beta version it didn't crash a single time; not one and for that I give a decent amount of kudos to Disruptor Beam. If this game was built around the space battle concept it would be a flash in the pan and I'd be putting it down very quickly. Yes, this piece has its issues but it doesn't make up the majority of the game which is otherwise amazing. 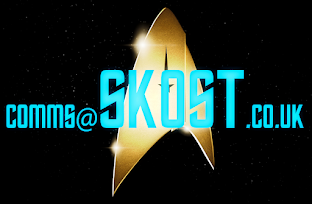 The return value is certainly there because I tend to be sending out shuttle missions with frightening regularity to help boost stats and get to the end of that next episode. 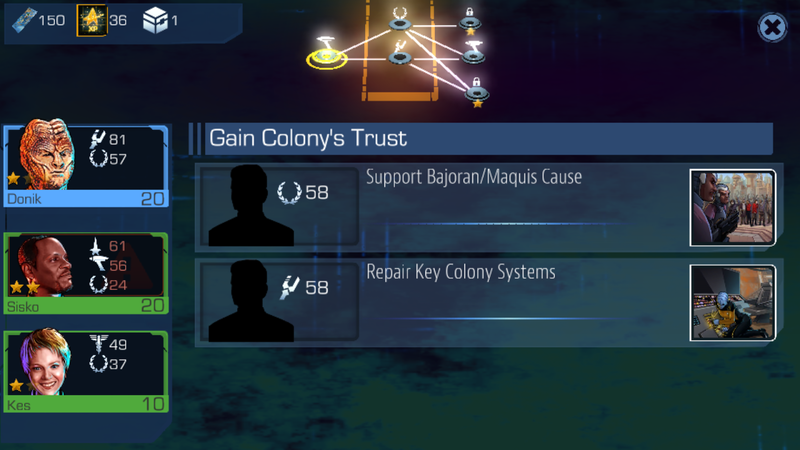 Having Sisko with a Diplomacy of 70 is fine but I can't do anything when he faces a challenge with a level of 80! 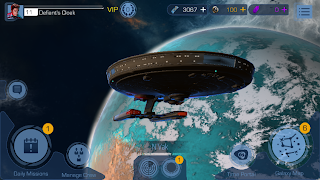 Timelines, even with its glitches, is still the bar to which all future Star Trek mobile games will have to aspire and be judged by and at the moment it is the final playable frontier. So I'm off to play once more and if you happen to chance across Defiant's Cloak on your screen at some point, add me up and say "Hi!" (my DBID is 519739818684416. 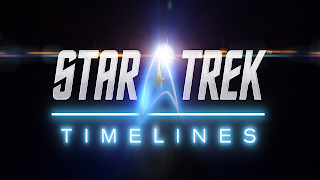 What's been your favourite part of Timelines? What characters are you finding the most useful or is there a tactic you've discovered? Let me know here!